Welcome to Beamer Smoke! This 9.5-inch quality hookah is an example of modern production applied to an old tradition. It is easy to assemble/disassemble, clean, and store away, making it the perfect hookah to take on the road. 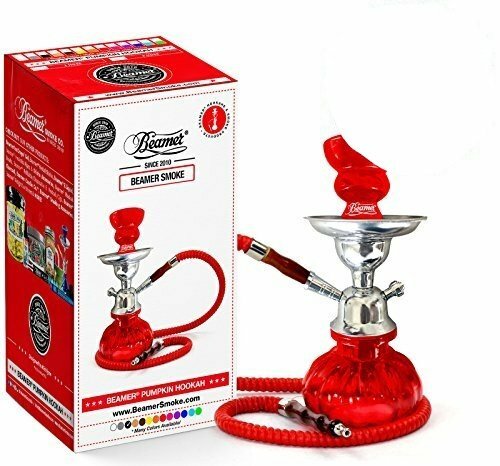 It works just as well as its larger counterparts and is very popular among new hookah beginners and seasoned hookah connoisseurs around the world. Beamer Smoke hookahs are built in an Egyptian configuration. Each ceramic bowl and glass vase comes bubble wrapped. This product is backed by a name you can trust in the smoking industry. If you purchase this item and it is not a Beamer brand product, please report the seller to amazon right away. Beamer now specializes in hookahs and hookah accessories, hookah flavors, vapor products, candles, smoking products and accessories, and rolling papers! Beamer Smoke was born in a small basement in Detroit, Michigan U.S.A. in 2010 by hookah aficionado siblings. Never knowing where Beamer's success would lead, Beamer started with one hookah and one case of orange Zig Zags. Now, Beamer is undeniably turning heads worldwide. Beamer's small business kept growing and growing into what they are today, a multinational company known for good, well built, functional products; sold, wanted, and known worldwide. Beamer Smoke aims to design high quality products and reasonable prices. Beamer® Smoke not only moved out of their basement, but they now have two factories in Detroit, Michigan U.S.A. and are opening a third in Europe, all thanks to customers like you! Check out all Beamer Smoke products on Amazon today! Great for gifts, parties, social gatherings, holidays, traveling, college and more!